Antibiotic-resistant tuberculosis is a public health threat. TB and other bacteria become resistant to antibiotics by evolving genetic changes over time, which they can do quite quickly because bacterial lifecycles are short. In fact, it takes only a single genetic mutation to grant TB resistance to isoniazid, one of the first-line antibiotics. Intrigued that such a small change results in such a consequential outcome, researchers led by Karen Dobos at Colorado State University undertook a study to determine what other effects might result from that same gene tweak. If they could uncover changes that make antibiotic-resistant TB vulnerable in other ways, Dobos' team reasoned, they or others might be able to one day target those weaknesses. The team's results, including new information about a potential TB soft spot, recently were published in the journal Molecular & Cellular Proteomics. In order to understand why Dobos' team did what it did, you have to keep in mind that TB, as the infection progresses, is constantly evolving. An antibiotic that beats back TB at first can lose its effectiveness. You also have to know that the antibiotic isoniazid depends on a protein produced by TB to extinguish TB. That is, the genetic change that makes TB resistant to isoniazid actually hinders production of that key TB protein. If the protein, called KatG, isn't there or is there but is in poor shape, the infection can rage on unencumbered by the antibiotic. First, Dobos and her colleagues obtained a TB strain sample from a patient at two different times: before beginning isoniazid and after the antibiotic stopped working. With those two samples in hand, the researchers examined proteomic and metabolic differences in the strains. They wanted to find out how losing KatG, which the second sample had done, affected other aspects of the bacterial cell. 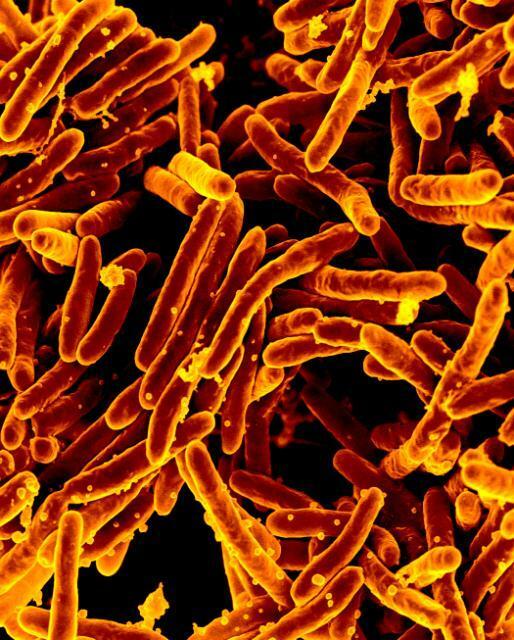 The researchers also examined TB strains, both responsive and resistant to the antibiotic, that had developed in another lab in a mouse model of infection. "Our expectation was that the lab-generated mutant and the clinical mutant would be relatively the same," said Dobos. "Whole-genome sequencing didn't show us anything substantially different." But while the bacteria from both the patient and the mouse had similar changes in KatG and no changes in other genes known to relate to virulence or drug resistance, the virulence of the strains turned out to be profoundly different. The resistant patient strain was much less deadly than its parent strain, but the resistant mouse strain wasn't that different from its parent in terms of virulence. Dobos calls this finding "a bit negative," because it means the same genetic change won't affect the bacteria in the same way every time. Even so, the bacteria did share some changes that add to researchers' body of knowledge about tuberculosis. For example, both strains that gained isoniazid resistance switched from reliance on glucose to reliance on fatty acids for energy. The fatty-acid metabolism pathway is already under investigation as a drug target by other groups. That pathway is a strong candidate for targeting in patients with isoniazid-resistant infections, Dobos explained, "because it is unique to bacteria and it's additionally unique to mycobacteria." In other words, humans lack the pathway, so targeting it won't disable it in patients, reducing the likelihood of side effects. Dobos said she hopes that a drug targeting that TB pathway "would be well tolerated and reduce some of the terrible problems that people who need multidrug therapy face."